In 2014, CEO Mary Ellen Moschetti founded and took on her latest venture of producing and manufacturing Parker Smith after founding and taking public a premier IT staffing company in the US. As a denim enthusiast, Mary Ellen created the line after experiencing and hearing too many complaints from women about struggling to find the right fit. She developed the line for contemporary minded women of all shapes looking for the 3 F’s – fashion, beautiful fabrics, and the perfect fit. Committed to producing and manufacturing premium denim, our collection is made locally in Downtown Los Angeles and is led by an all-female team. With an emphasis on premium fabrics and tailored silhouettes, Parker Smith has developed a universally flattering fit for all body types. Focusing on mid and high rises, our designers have specially engineered the perfectly fitting and slimming jean. Strategically placed back pockets lift and flatter the backside and a contoured waistband ensures premium comfort while enhancing all silhouettes. Our exceptional fit has been awarded by People StyleWatch as "The Perfect Jean for Your Waist". Each step of production, from the design to development, happens exclusively in the heart of the fashion district in Los Angeles. Our designers, sewers, dye houses, and contractors are all employed locally. We create our designs, cut and sew each of our samples, manage our production, and warehouse our goods in our Downtown Los Angeles headquarters. Our commitment to producing locally has allowed us to create the finest quality product and top-notch customer service. We strongly believe in supporting local businesses and take pride in being a part of such a vibrant community. Known for having an impeccable fit and sophisticated aesthetic, Parker Smith has become a celebrity and editorial favorite. Our loyal following includes Gigi Hadid, Miranda Kerr, Jennifer Aniston, Lilly Collins, Lucy Hale, Alessandra Ambrosio, Cindy Crawford, Anne Hathaway, Lupita Nyong’o, Zoe Saldana, Tyra Banks, Sharon Stone, Kris Jenner, Kelsea Ballerini and many more. 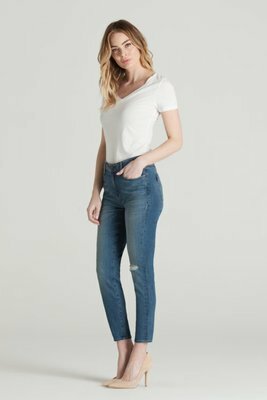 Refinery29 did an exclusive article on our line titled "Gigi Hadid Has Been Wearing This New Denim Brand Constantly" and Racked.com called Parker Smith "The Best Denim Brand You Probably Don’t Know About" – a celebrity approved denim brand that lives up to its hype. Other features include WhoWhatWear, Instyle, People.com, Harpers.com, and Vogue.com.